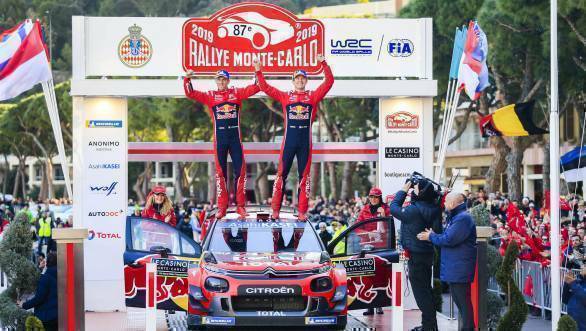 The six times World Champion Sebastien Ogier won Monte Carlo by a record-breaking smallest winning margin in memory and his team Citroen scored their hundredth WRC victory. After half the event where the leaders were never more than around five seconds apart, he matched Sebastien Loeb's record of seven Monte Carlo Rally wins and equalled Walter Rohrl's record of winning the event with cars from four different manufacturers. Cold conditions led to several punctures, notably for the fastest driver on the event Ott Tanak, and an early stage cancellation, caused by spectator difficulties, upset many team strategies. M-Sport Fiesta driver Gus Greensmith cruised to victory in the new WRC2 Pro series, Yoann Bonato (Citroen) won the WRC2 amateur class while Enrico Brazzoli won the R-GT category in an Abarth 124. Toyota cars won nine stages, Hyundai five, the winners Citroen two while last year's winning team M-Sport won none at all. The opening round of the 2019 season saw a variety of new driver-team associations, the most dramatic being the return of the reigning World Champion to the Citroen team which was where he began his professional career. This was the third time he had won Monte Carlo on the first time he had driven for a team with a new car! It was Ott Tanak who took an early lead at the two nighttime stages which started the rally, but as soon as the event restarted on the Friday morning, there was confusion. In the first loop of three stages, there were widely varying conditions with frozen snow, mostly clear conditions and a complicated mixture. Crews had to carry a set of six tyres, choosing each time the four tyres most appropriate  meaning least disadvantageous - each time. 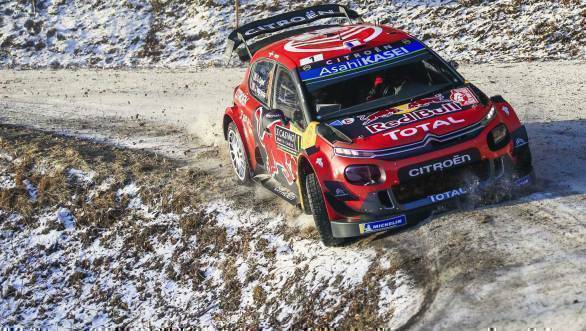 Veteran Sebastien Loeb bet heavily on the second clearest stage while Ogier dropped back behind Thierry Neuville and Tanak struggling with studded tyres in the clearer conditions. In the afternoon Ogier pulled back and by the middle stage of the afternoon when Tanak had punctured, dropped to seventh, Ogier had taken the lead. By Saturday evening Ogier led Neuville by 4.3 seconds, third place Loeb led Latvala by 2.3 seconds while Tanak was making a string of fastest stage times in fifth place  eyeing the possibility of a podium result. The fight for the top places became intense. The general consensus before the event was that Toyota and Hyundai were expected to be the strongest teams of the season but the two-car Citroen team had taken the opening honours. Toyota's hopes of victory were dashed by Tanak's puncture, seemingly caused by a broken wheel, while Jari-Matti Latvala momentarily rose up to third before being passed by Tanak and Loeb. Toyota newcomer Kris Meeke was another broken wheel victim, but saved his energies for the PowerStage which he won in style. It seemed that Toyotas wheel problems had been caused by excessive corner-cutting, normally harmless, but in the hard frozen ground had been too demanding. Hyundai had been lying a promising 2-3-4 on Friday afternoon but on Saturday Andreas Mikkelsen went off the road. Loeb understandably spent time learning his car which he had little chance to test before he event, but by playing the tyre choice game skillfully he won two stages during the rally, helping Hyundai take the manufacturers' championship lead. 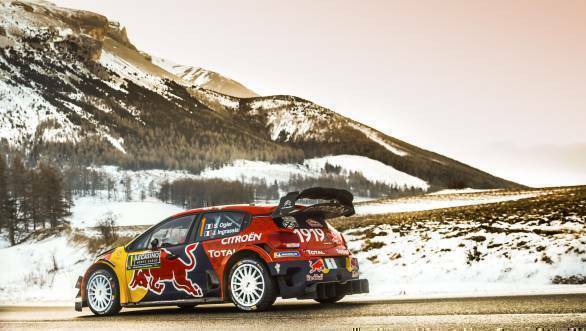 Ogier and Ingrassia pictured here on the snow-covered stages of the Monte Carlo Rally. While Ogier's teammate Esapekka Lappi rose as high as fourth on the opening night, their Citroen team (the small two car outsider team) were discovering first hand just how much of a treasure Ogier had become in the seven seasons since he was last in their team, as they suffered the blow of newcomer Esapekka Lappi retiring with engine failure. Rejuvenating the M-Sport team, now bereft without a top level driver, was a struggle. Elfy Evans was stoically holding down sixth place before falling back with a puncture and then had a heavy impact with a tree. Teemu Suninen recovered after going off the road on the opening stage and finished eleventh while guest driver Pontus Tidemand missed stages on the Saturday, when a wishbone broke and was classified 20th. Both drivers scored Manufacturers' championship points for the team. Monte Carlo 2019 was not M-Sport's finest hour, except that their R5 driver Gus Greensmith won on the debut of the WRC2 Pro category. This promising class was disappointing in that only three cars were entered, one of which (Yoann Bonato) opted out of the category on account of commercial conflict and the favourite, Skoda's Kalle Rovanpera, crashed and lost time on the opening evening. His Skoda was repaired overnight and he completed the route as second FIA points scorer for being the only other finisher. Bonato meanwhile ran away with the R5 entry but then eased his pace and dropped back behind Greensmith and won the Amateur WRC2 category. Third WRC2 amateur entry was 23 year old French Junior Champion Adrien Fourmaux on his first event outside the French national championship.